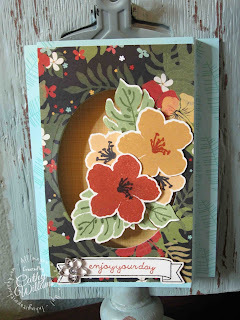 Inking It Up With Cathy: Botanical Blooms & Some New Features Coming Soon! Botanical Blooms & Some New Features Coming Soon! Oh my gosh, it is time! I am back and committed to sharing my love of Stampin' Up! with you. As you may notice, my blog has changed a bit and over the next few weeks you will begin to see new ways that I will be sharing with you. How about a Tippin' on Tuesday? What's that? Tippin' on Tuesday will be a video posted each Tuesday with a tip, trick or technique. Do you love that? How about a Fast & Fabulous Friday? Besides the fact that it is Friday, this video will show you a quick & easy card you can make over the weekend. 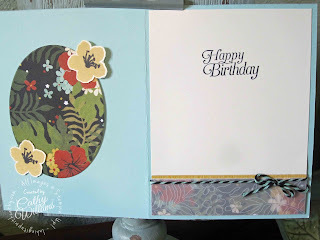 In the meantime, here's today's card using the Botanical Blooms stamp set. This designer series paper has retired but there are a number of current papers that would work really well with this stamp set including Irresistibly Floral, Affectionately Yours and Moroccan designer series papers. As the sentiment says, enjoy your day!